Elementary Statistics: Picturing the World, Fifth Edition, offers our most accessible approach to statistics-with more than 750 graphical displays that illustrate data, readers are able to visualize key statistical concepts immediately. Adhering to the philosophy that students learn best by doing, this book relies heavily on examples#x13;25% of the examples and exercises are new for this edition. Larson and Farber continue to demonstrate that statistics is all around us and that it#x19;s easy to understand. Ron Larson received his PhD in mathematics from the University of Colorado in 1970. At that time he accepted a position with Penn State University, and he currently holds the rank of professor of mathematics at the University. Dr. Larson is the lead author of more than two dozen mathematics textbooks that range from sixth grade through calculus levels. Betsy Farber received her Bachelor's degree in mathematics form Penn State University and Master's degree in mathematics from the College of New Jersey. Since 1976, she has been teaching all levels of mathematics at Bucks County Community College in Newton, Pennsylvania, where she currently holds the rank of professor. She is particularly interested in developing new ways to make statistics relevant and interesting to her students and has been teaching statistics in many different modes - with TI-83/84, with MINITAB, and by distance learning as well as in the traditional classroom. "Boring book, professor even said it was boring, but less boring than the other available books." This book was OK. It is well-organized, but it doesn't explain things very well. I ended up needing a tutor in this class (but to be fair), I'm not a great mathematical student. 3 stars by my count. 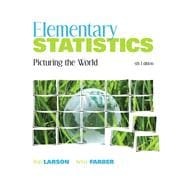 Elementary Statistics : Picturing the World: 3.5 out of 5 stars based on 2 user reviews.